Picasso once said “The important thing is to create”. We may not all consider ourselves artistic, or creative, but that is not the point, the important thing is to create. Two Saturdays ago, on the 22 March 2014, we took on the challenge and opportunity to teach the importance of creation, through hosting our first dedicated Art Day. 58 volunteers gathered at St Francis boy’s home Keen to create. 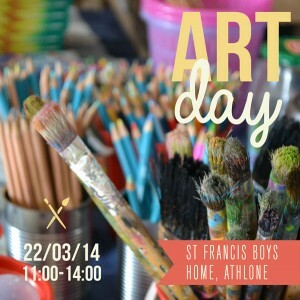 That is to create art, memories, the ideas of possibilities and bonds with the boys of St Francis. What a blast we had! The boys moved from station to station experiencing different ways of making art. From string art painting, to collaging, ink art, origami, potato stamping and abstract art creation, to cupcake decorating. With hands on leaders escorting the groups of kids between stations, and leaders at each station ready to guide the creative tasks, the end results were messy hands, wonderful creations and happy hearts. With some free time before the final rotation, the kids and volunteers spent time together outside, having lunch, playing soccer or just fooling about on the jungle gym. Then we rounded off our day with cupcake decorating, because who says you can’t have your cake and eat it too, and the classic St Francis home thank you. What we learnt from this experience is exactly what Picasso said “The important thing is to create”. To create ways of channelling these boys’ energy into something positive, to create an opportunity so that volunteers can give back and through this create positive memories for these boys and to create a stimulus for creative thinking that spills over into their lives. As Picasso once said “Every child is an artist. The problem is how to remain an artist once he grows up”. Our volunteers were keen, the St Francis boys were keen, are you keen? Show it by joining us at our next event.